Yes, I am making a list. Yes, I am checking it twice. One of the joys of my life is that I got infected with a reading habit at a young age, and have been mainlining books ever since. I’m absolutely obsessed with learning from beyond my own direct experience. and a mind needs books as a sword needs a whetstone if it is to keep its edge. That’s why I read so much Jon Snow. So with most of my friends taking some kind of break over the next few weeks, I thought I’d put together a short list of the core books that critically inform or summarise my thinking on a few core matters. While some of these are fairly practical and offer great guidance on what to do; it’s all what’s behind those practices and the impact on my mindset that’s the selection criterion here. This book was a revelation to me. It explained to me for the first time why all the good stuff I knew and loved was so effective. I remember sitting in a hotel restaurant in Swindon and utterly devouring it. It does contain a little bit of maths, but given that I didn’t formally study maths past age 16, and I coped, I don’t think it’s too high a bar. My first physical copy ended up with highlighter on nearly every page. I have asked Don if he can arrange printing on luminous yellow paper to save effort, but so far without success. I’ve written about this book before. It’s the book I wish I’d had when I first started to be a consultant almost 20 years ago. If you’re in any kind of helping relationship – and all consultants and coaches are – then this will be massively useful to you. Having read this, I learned never to inflict help (thanks to Tobbe Gillebring for that phrasing) on anyone, if I want that help to be actually effective and a good use of anyone’s time. Again, I remember where I was when I read most of this – in Bangalore, on this trip. This entirely changed how I think about talent and capability in people. Including myself. And my family. Linda Rising has a point of view that the Agile mindset is the Growth Mindset. I agree. I’m deeply convinced that nearly everything I do is to help people take on a Growth Mindset. People with a growth mindset are constantly monitoring what’s going on, but their internal monologue is not about judging themselves and others, and dividing them into winners and losers. Smart people and dumb ones. Certainly they’re sensitive to positive and negative information, but they’re attuned to its implications for learning and constructive action: What can I learn from this? How can I improve? How can I help my partner do this better? In a mindset that starts from an assumption of improvement-built-in, it’s critical. I find it really interesting that – as a life long pacifist – I’m increasingly drawn towards military thinking on how to work with groups of people facing significant uncertainty yet needing to produce results. Between this, Team of Teams and Turn the Ship Around, my assumptions about how vision is turned into the actions that aim to fulfil that vision have been entirely contradicted. This is on the face of it an analysis of the Prussian military machine that was so effective, that even a hundred years later, it took the entire world uniting against it (and in one case, having a lunatic for a leader) to beat it in the field. Once you get past the actual content, you realise that the most effective approach is a highly human-centred one; that shows great respect for the people who are actually prosecuting the actions, their knowledge of the situation and their ability to be creative when circumstances change. As long as you’re very clear about the Why and What of it. If Growth Mindset teaches us a target state for how we’d like people to think, and Art of Action teaches us how to generically translate strategy into action, what would a sustainable system for obsessive problem solving & improvement look like, and how would we deeply embed it into an organisational culture? Once the expensive consultants have gone away, how does an organisation continue to be focused on a vision of ‘better’ within its own structures? That’s what Toyota Kata is about. It’s about a system of thinking based on a scientific approach of experimentation, run within chains of line management, and how we more effectively learn by doing, building habits through repetition until they become part of us. Combined with the strategic intent of The Art of Action, this harnesses the autonomous action of every person in the organisation to deliver quite spectacular outcomes. If the previous 2 books have been about chains of leadership and command, Jean provided a powerful counter tension, towards the power of working collaboratively. And her influence on the Agile community is vast. 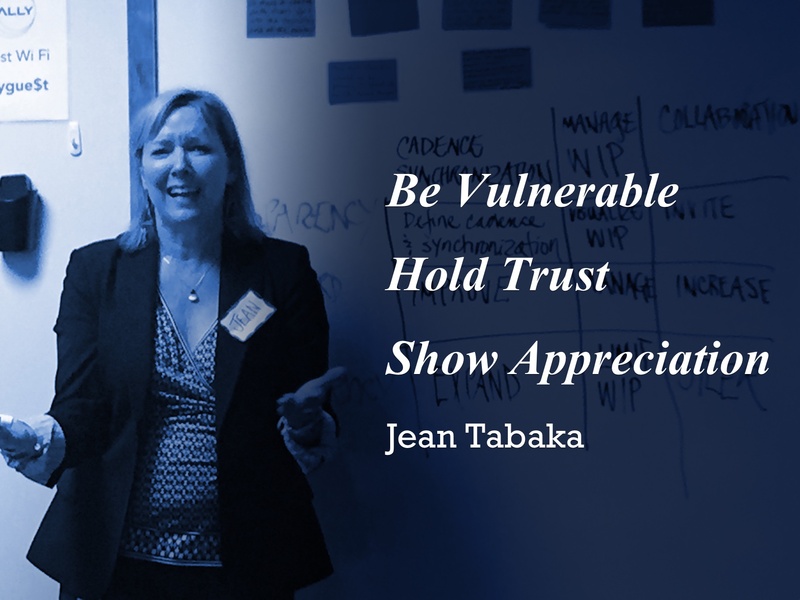 Anything you see from Agile people about bringing your whole self to work, or accepting others, or authenticity in your work, or the power of joyful, fulfilled teams… chances are, that came from Jean at some level. I had the great privilege and joy of being a colleague of Jean’s at Rally, and having her coach me to facilitate a meeting of 50 coaches. A very high bar! And I still have the great sadness of not having known her long or deeply enough before she left us. This book has strong echoes of many themes in the other books above, about people-centred, purpose-driven valuable work, and reminds me every day of the effectiveness of ‘we’. So that’s my 6 of the best. What books shaped your thinking the most? Comments below! Christmas Reading: 6 Books That Will Change Your Thinking by Martin Burns is licensed under a Creative Commons Attribution-NonCommercial-ShareAlike 4.0 International License.